Garage drain shall be heavy-duty type as manufactured by Rockford Separators, Inc., Rockford, Illinois, and as noted on plans. Furnish ______Rockford Model RSD-30-RC Garage Drain (or Rockford Model RSD-30-IC Garage Drain with extra-deep body) with heavy-duty, non-breakable ASTM-A242 Cor-Ten® inlet grate, integral deep seal trap, removable sediment pan, extra-wide concrete anchor flange, double vent connections and cleanout level with floor. OPEX® Shop Coat coating inside and bituminous coating outside. Non-puncturing flashing clamping device with stainless steel bolts. Epoxy coating inside and outside. The RSD Series Garage Drains have been designed for use in multi-story garage structures, upper level garage facilities, parking concourses and driveway approach ramps. The medium depth of the RSD-RC garage drain permits its use in upper level facilities. The extra-deep body of the RSD-IC permits its use at grade level or where there is no open area below the drain. This is not an oil separator. 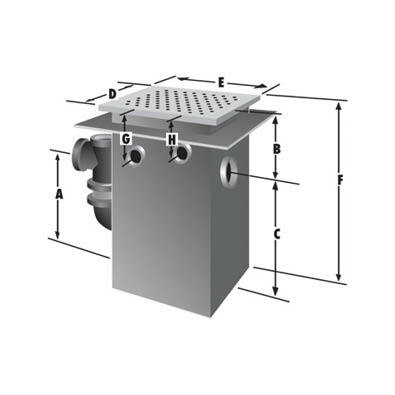 The RSD Series Garage Drain should be used in conjunction with an oil separator. The information provided has been prepared as a guide for architects, engineers, plumbing contractors, building officials and municipal authorities concerned with high standards of sanitation and construction.